We saw an initial recovery in gold futures yesterday, on the back of a weaker US dollar, but that boost evaporated once investors fell back into a risk off mood. Just as in previous sessions, gold acted less like a safe haven and more like any other commodity that is inversely correlated to the dollar. The precious metal finally closed the day $3 lower at $1,557.60. At the time of writing, the gold market is at $1,562 but, despite breaking below its multiyear upward trendline, the $1,530-5 area is the major support level to watch. Gold has bounced off this three times in the past eight months and a break lower could really open the flood gates. The price of US crude oil stopped for a breather yesterday, as bargain hunters joined the market and tried to push above the psychologically important $90.00 mark. The session ended with an anaemic gain of $0.13 to $90.66, which hardly changes the overall bearish picture. If the US dollar keeps seeing safe haven demand, things could really turn ugly for buyers. The continued flight into the safety of the US dollar put downward pressure on the whole commodities spectrum yesterday. As a result, the gold market posted another decline, falling $6.52 to $1,560.7. Unfortunately for the bulls, the precious metal has definitely lost some of its appeal as alternative asset. With inflation fears currently at the back of investors' minds, is the possibility of QE3 the only factor that could boost gold? As if the crisis in Europe was not enough to scare energy investors, the weekly US oil inventories showed that supply is at a 22 year high. Consequently US crude oil futures plunged again, this time crossing under the $90 level to close $1.64 down for the day at $89.90. In fact the market even saw a fresh recent low of $89.29, last seen on 1 November, which shows how much bearish sentiment is currently in the energy sector. The dollar strength extended the weakness in the gold CFD trading market for the second day in a row as concerns over the Eurozone debt crisis remained in focus. The precious metal lost $25.67 to $1567.20 as it became increasingly obvious that buying gold as a safe haven has been trumped by its inverse correlation with the dollar. The rush into the safety of the US dollar triggered a sell off in Nymex crude oil prices yesterday, with the market finishing the session $0.98 down at $91.66. Along with anxiety about the European debt crisis, there were fresh hopes that Iran and the West might come to an agreement. Any such agreement would further reduce the need for the risk premium that is currently built into prices. The US weekly crude inventories, due out later today, will be closely watched for any extra clues on the next possible direction. Economic data comes in the form of UK inflation numbers this morning which are expected to rise month-on-month but fall year-on-year. Even with the lack of growth in the UK economy, inflation is being propped up by high oil futures and the BoE's QE program. Despite the recent correction in the price of crude oil, petrol prices haven't fallen from their record highs and it still costs an arm and a leg to fill up the car. High inflation has been the bane of the UK consumer's life for the last few years as people have seen their real disposable income falling. It's little wonder that Marks and Spencer has seen such a huge drop in sales for the last year. Gold CFDs closed marginally lower yesterday at $1,592.20 as investors struggled to find a reason to buy the precious metal. At the G8 meeting over the weekend, world leaders failed to deliver a meaningful conclusion, despite expressing their support for Greece. Although gold seems to remain a good hedge over the longer term, the short term picture looks a bit more unpredictable. A rally in equities helped drive yesterday's rise in US crude prices, along with a Chinese commitment to boosting economic growth. A weaker dollar also played its part and so oil ended the day $1.30 higher at $92.57. However, the chart continues to indicate that the overall trend remains firmly bearish. Investors will be closely watching the weekly US oil inventories for any indication of a change in the oversupply. Gold continued its rebound on Friday, gaining $18.73 to $1,592.90 as bargain hunters came into the market. The weaker US currency was the main reason behind the rally, as it made the dollar denominated gold market look cheaper. It's also possible that some investors took a second look at the Fed's recent choices and decided that QE3 is still a possibility. In the crude oil markets, it didn't seem to matter that the dollar was under pressure on Friday, even though this would usually support the price of black gold. Instead, weak US economic fundamentals continued to dominate the energy sector, which was already spooked by fears over reduced European oil demand. In the end, WTI crude prices fell by $1.38 to $91.48, but not before touching $90.93, the lowest point since 3 November last year. Gold's safe haven status was clear in yesterday's commodities trading, with the precious metal posting one of its highest gains for the year. The boost came from the extremely poor Philadelphia Fed manufacturing figures, which struck a chord as the market was not expecting a weak reading. The $35 gain to $1,573.0 followed on from heavy selling earlier in the week as gold was weighed down by a rallying US dollar. Currently the precious metal is trading at $1,574. The price of crude oil continued its decline yesterday by moving in the opposite direction to gold after the weak US manufacturing figures. As the fundamental picture begins to suggest that there could be a harsh contraction in economic activity, the bears seem happy with the adage 'Sell in May and go away'. Currently, UK crude oil futures are trading at $106.76. In commodities trading, yesterday gold hit new lows for the year at $1,527 an ounce before staging a modest comeback to close at $1,540. The precious metal initially saw downside pressure as Greek turmoil kept safe heaven flows going into the US dollar. However, the FOMC minutes hinted that, given the state of the global economy, the Fed was becoming more open to another round of easing. This sent the dollar down and gold up. 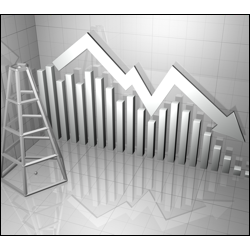 The price of crude oil continued its downward trajectory yesterday. Traders factored in further supply increases and diminished global demand. US crude oil also fell as inventories increased by 2.1 million barrels against an expected increase of 1.4 million barrels. Gold continued to fall as traders dumped risky assets and piled into the safety of the US dollar. The gold spread trading market traded as low as $1,541 an ounce. With little technical support seen until $1,531, and no turn around in Greece on the horizon, the downward trend looks set to stay firmly in place. Dollar strength and increased supply data from the API kept the downward pressure on crude oil prices. The June contract is now firmly below the $93 level. Data from the American Petroleum Institute showed that supplies have surged and traders are now re-pricing expectations for today's EIA supply data. Gold prices suffered yesterday, falling $21.84 to trade at $1,557 an ounce, as risk aversion sent traders piling into the dollar. Gold had previously been the asset which traders jumped into during moments of uncertainty. However, it has recently caught some traders off guard by recoupling with other commodities and returning to its inverse relationship with the dollar. Crude oil made fresh lows for the year yesterday, shedding $1.41 to close at $94.20. Sentiment remains sharply negative and it doesn't look like this will be changing any time soon. With turmoil in Europe and slowing Chinese growth, demand for the black gold is set to remain weak. In addition, mounting supplies from OPEC and expectations of another increase in US stockpiles, are keeping crude oil futures on a downward trajectory. Gold futures continued to slide on Friday as risk aversion sent more traders fleeing into the safety of the US dollar. The recent rush into dollars has seen the gold market reach new lows for the year. Spot gold also fell 0.8% to $1,580.25 an ounce, shedding 3.7% on the week. This morning that weakness is continuing, with the precious metal at $1,570. US crude oil futures continue to hold below the $96 level. Prices are being pressured by the slow down in China, turmoil surrounding Greece and the news from OPEC that supplies are 8% higher than consumer demand. With more than ample supplies and negative cues in the global economy sapping demand, the price of crude looks set to remain under pressure for some time.